Egon Schiele (1890 – 1918), Triestiner Fischerboot (Trieste Fishing Boat), oil and pencil on canvas, 75 by 75cm. 29½ by 29½in. Painted in 1912. Estimate £6,000,000-8,000,000. Courtesy Sotheby's. 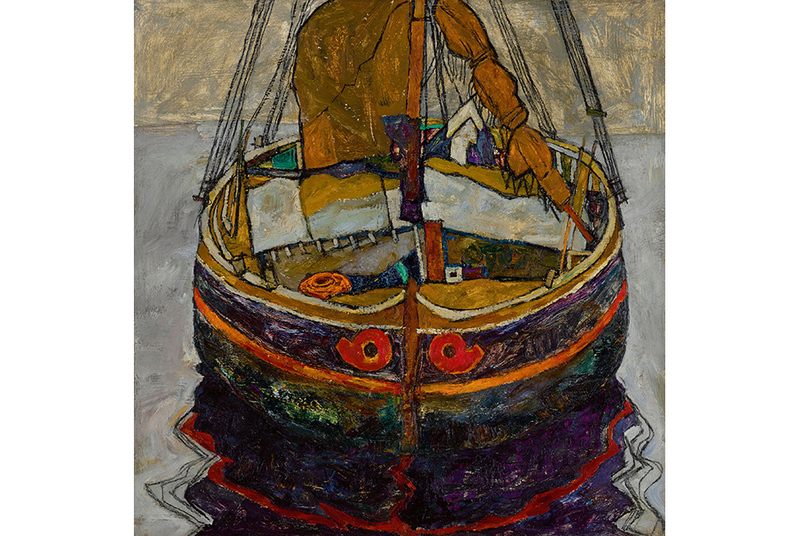 Painted in 1912, Triestiner Fischerboot (Trieste Fishing Boat) holds a unique position in Schiele’s oeuvre and was created in the aftermath of what was arguably the most tumultuous and life-changing experience for the artist. Recently released from a brief period of incarceration in Neulengbach in Austria, and rejected by the local community there, Schiele’s visit to Trieste in 1912 was prompted by a desire to escape the grim memories of his recent past, and relive fond memories of earlier visits shared with his beloved sister Gerti in 1907 and 1908. It also prompted an unleashing of radical new artistic expression. In a year of iconoclastic developments across Europe that forever altered the direction of twentieth-century art, from Cubism, Orphism and Futurism to Expressionism, Schiele sought to explore in oil a thoroughly modernist treatment of colour, surface, pattern, texture and form. Offered at auction now for the first time, having been in a private collection since 1962, it will be presented as one of the highlights of Sotheby’s Impressionist & Modern Art Evening Sale in London on 26 February with an estimate of £6,000,000-8,000,000. Adopting a square format for this work, Schiele challenged the traditional notion of perspective in landscape painting with a foreground and background. Instead, he transforms the canvas into a composition of patterns and clearly delineated forms with little or no reference to perspective. In this he was indebted to Gustav Klimt, his friend and contemporary, who had been using the square format for his landscapes since the closing years of the nineteenth century, around the same time Claude Monet started using a square canvas for his depiction of waterlilies. The painting’s vertiginous, flattened and closely-cropped perspective and bold use of bright patches of pure colour are a distillation of Schiele’s reorganisation of form within the melting pot of European avant-garde painting. In the summer of the preceding year Schiele and the model Wally Neuzil had settled in Neulengbach seeking inspiration but Schiele’s bohemian lifestyle scandalised his conservative neighbours. The couple found themselves in a precarious position when a retired naval officer’s daughter asked for their help to run away and although they returned the girl to her parents, the artist was arrested and placed on trial. The experience and particular loss of freedom it entailed was to have a marked effect on Schiele’s life and work. Drifting in what appears to be an open sea, the boat in this painting can be seen as a powerful symbol of the artist’s state of mind, conveying the same haunted vision expressed in the artist’s portraiture.